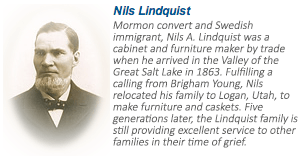 Upon arriving in Salt Lake City in 1863, Swedish immigrant and Mormon convert, Nils (Niels) A. Lindquist, established himself as a premiere furniture maker. One of his beautiful beds is still exhibited today in Brigham Young’s Beehive House in Salt Lake City. Nils’s oldest son, Charles J. A., learned the family trade starting with his father and following the first of two LDS missions to Sweden, moved his family to Ogden establishing a mortuary in 1885. As his sons Carl, Clyde, and Milton entered the family business the name evolved to C.J.A. Lindquist & Sons Mortuary. Upon C.J.A.’s death in 1934, his sons, along with his second wife, Ada, continued their service to the families of northern Utah. Their son, John A. Lindquist, began working at the mortuary at an early age. He obtained his education at Weber College and served with distinction in the Army Air Corps in WWII. In 1941, construction began at Lindquist’s main mortuary facility located at 3408 Washington Blvd. President David O. McKay, a counselor in the First Presidency of The Church of Jesus Christ of Latter-day Saints and future Church president, dedicated Lindquist’s Colonial Chapel in 1942. This landmark facility serves people of all faiths in an atmosphere of peace and serenity. In 1949, the former Clearfield’s Sunset Mortuary became Lindquist’s Clearfield Mortuary and in 1960, Lindquist’s Kaysville Mortuary was constructed. In order to better serve a growing Davis County, Lindquist’s Bountiful Mortuary opened in 1966 with extensive remodeling and expansion in 2003. Lindquist’s North Ogden Chapel was dedicated in 1981 and Lindquist’s Layton Mortuary opened in 1984. To serve north Davis County’s burgeoning population, construction on a new mortuary in Layton, currently Utah’s largest, was completed in 1997. Lindquist’s Roy Mortuary opened in 2004 patterned after Layton’s elegant design and maintaining Lindquist’s distinctive American Colonial motif. Click here to view all of our mortuaries. Lindquist’s owned and operated cemeteries include Lindquist's Washington Heights Memorial Park and Mausoleum, South Ogden, 1947; Lindquist's Memorial Gardens of the Wasatch, South Ogden, 1967, and Lindquist's Memorial Park at Layton, 1988. Click here to view all of our cemeteries. Lindquist Mortuaries joined an exclusive, worldwide association of independently-owned and operated mortuaries and funeral homes in 1952. Only privately owned, independent funeral homes adhering to the highest standards of integrity, excellence, and superior public service are nominated for membership. Lindquist’s has proudly achieved membership in Selected Independent Funeral Homes (SIFH) since induction over 50 years ago. John E. Lindquist serves as President of Lindquist Mortuaries/Cemeteries and is the Founder and Chairman of the Board of Great Western Insurance, a national prearranged funeral insurance company. He recently relinquished the position of President of Great Western to his son, John A. Lindquist. Robert E. Lindquist serves as president of Lindquist's Memorial Parks. Lindquist Mortuaries’ General Manager is Craig J. McMillan. Even with our lengthy history and tradition of service dating back to 1867, at Lindquist Mortuaries/Cemeteries, we know that our good name is something we have to earn every day.